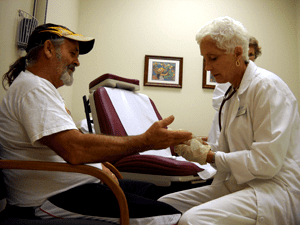 Marvin’s Story – Neighborhood Health Clinic, Inc.
Marvin has lived in Collier County most of his life and works as a line cook at a local seafood restaurant. Due to the downturn in the economy, he’s only working 20-24 hours a week—he used to work 60 hours per week. He was referred to the Clinic by a coworker, found out he had diabetes and has been treated there ever since. In addition to treatment, the Clinic has taught him about making better diet and lifestyle choices.